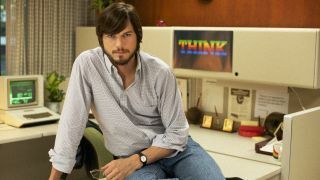 The Steve Jobs biopic starring Ashton Kutcher will land in cinemas in April 2013, in time to coincide with Apple's 37th birthday. Yes, we're all disappointed that it's not a rounder number but that's just how things are. Be grateful that it's getting a theatrical release at all, as some feared that the relatively low budget biopic would be a straight-to-TV affair. The film makes its global premiere at Sundance Film Festival on January 25, followed by release on April 19 in US cinemas - no official word on a global release date just yet. This particular Jobs biography is not based on the popular Steve Jobs biography written by Walter Isaacson - that's forming the basis of Sony Pictures' megabucks Social-Network-alike flick which isn't due out for an unspecified number of months (years?) but is being written by Aaron Sorkin. The Kutcher-toting film is an independent one directed by Joshua Michael Stern and has already dazzled Apple fans with its star's likeness to its subject.